The Dishmatic Washing Up Liquid Dispenser is popular – in fact it’s a customer favourite… you only have to look at the reviews on site – one customer described it as a “Family fab product, great price”. I couldn’t agree more! 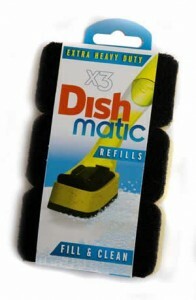 The truth is everyone has to do the dishes – even if you have a dishwasher you can’t completely escape this! And for something you have to do every day anything that makes it quicker, easier and more economical has to be a good thing! I was advised to mix my Dishmatic Dispenser with a mix of washing up liquid and water, which was good advice. You save on the washing up liquid and it does a brilliant job when mixed with water. For general plates and cups it was great, but it really surpised me how effective it was at cleaning baking trays and bakeware. I used the Dishmatic Heavy Duty Head to clean a baking tray which would normally have taken me a lot of scrubbing – because I didn’t have to get my hands in there I was able to do this while it was still warm helping to remove all of the baked on grease. However with 3 different replacement heads – Non Scratch Replacement Heads, Heavy Duty Replacement Heads and Extra Heavy Duty Replacement Heads, it can tackle everything you could possible want to wash up! 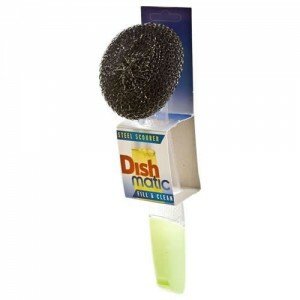 For even harder jobs the Dishmatic Scourer Washing up Liquid Dispenser is great – I tested this on my grill pan and the knitted mesh was good for removing bits of baked on food from awkward areas such as in between the slats. 2. Use it as a cleaning brush – fill it with a cleaning solution and it becomes a brilliant brush for cleaning the sink, plant pots, windows and more! 5. A Water Saving Device – you’ll use about 80% less water when doing the dishes – and it will save you money because you’ll certainly use a lot less washing up liquid! 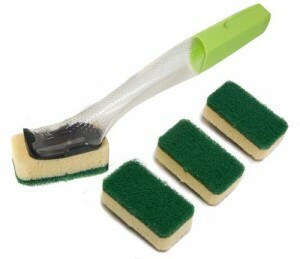 As mentioned the Dishmatic Scourer Washing up Liquid Dispenser is also available with it’s long lasting knitted mesh of high grade stainless steel it will take care of these tougher jobs and save time.